Battle In Seattle is a movie that I highly and passionately recommend. 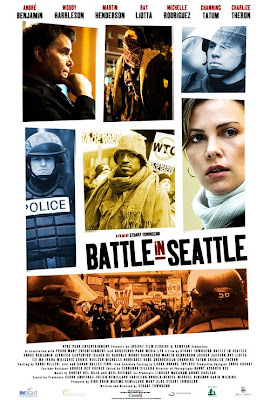 Directed by Stuart Townsend and starring Charlize Theron, Andre 3000, Woody Harrelson and Ray Liotta, the film centers around fictional characters taking part in the actual 1999 protest surrounding the WTO's annual summit in Seattle. The film is fantastically done and is a great use of art to speak out against the injustice of the WTO and the US political system as well. I won't go into much detail, but I will highly encourage you to check this film out at your first chance. Patrick, I would love to hear your uncensored views on politics sometime. Or just see your face. Both would be ideal.